The above quote speaks to the enormous conflict of interest within the medical establishment: members of vaccine advisory and approval boards more often than not have financial interests in promotion of vaccines, either by being outright patent holders (as in the case of Paul Offit, MD) or on the payroll of BigPharm itself. Members of the CDC and FDA move back and forth among industry and academia and government. That is not necessarily a conspiracy but simply the way the world works. There is little or no independent oversight. 'Peer-review' is upheld as a gold standard, but there is no protection against group bias when all of the 'peers' believe in the same paradigm, i.e., that vaccines work, period. No study comparing a vaccinated population versus a non-vaccinated one has ever been done. Further, vaccine/drug manufacturers (the same folks) regularly engage in criminal behavior: billion dollar fines are now commonplace. The known risks are minimized, yet the U.S. government pays $100 million dollars a year in compensation for vaccine injuries, while even the CDC and FDA admit that less than 1% of injuries are actually reported by doctors. CDC (Center for Disease Control): zero US deaths from measles in the past 10 years (2004-2015). VAERS (Vaccine Adverse Effects Reporting System): 108 US deaths from measles vaccine in the past 10 years. There are many other adverse effects reported besides death; the government estimates, however, that less than 10% - some say 1% - of adverse effects are actually reported by doctors. Approximately 25,000 adverse events are filed yearly; if only 10% get reported that is 250,000, if `1% 2,500,000!). Science Fact: the measles vaccine has not been proven to prevent measles. Zhejiang province in China (population 54 million) has a 99% measles vaccination rate. Measles continues unchecked. Same in America, with an 85%-95% rate. Outbreaks have been reported repeatedly over the past 30 years in populations with 100% vaccinated, so even vaccinating the remaining few percent of unvaccinated will not solve the problem. Science Fact: There is no ‘single’ measles vaccine available in the US, that is, everybody has to get the MMR shot: measles-mumps-rubella. The safety of a trivalent vaccine has not been tested. Thousands of adverse reports have been filed. The mumps portion of that vaccine has been in litigation in US district court, for 5 years, with Merck sued for fraud. That case is undecided, but the MMR shot continues for every child, with the presumption of safety. Science Fact: Measles mortality was down more than 95% before the MMR vaccine began in 1978. See this graph from national statistics of US Dept of Commerce, Historical Statistics of the U.S. Part 1 Bureau of Census 1975. Or this, from the excellent vaccination and public health history, Dissolving Illusions: Disease, Vaccines, and Forgotten History by Suzanne Humphreys, MD. Also see Vital Statistics of the US,1937-1992. To repeat from Vaccination: Part One: Metropolitan Life Insurance Company - hardly a source to lie about statistics - in 1948 reported: “…the death rate of diphtheria, measles, and whooping cough declined 95 percent among children from 1911 to 1945, before the mass immunization program started in the United States.” VACCINATION TAKES CREDIT FOR SOMETHING THAT WAS ALREADY GOING ON. IT DID NOT ERADICATE THE MAJOR INFECTIOUS DISEASES. That much is indisputable, and hardly anybody dares to talk about it. The only remaining question is whether and how much an effect it may have had on any further increase or decrease of these already almost wiped out diseases. The full impact of this may shock you, as it is not taught in medical schools, certainly not entertained in the medical societies, the AMA, APA (pediatricians), nurses organizations, pharmacies, etc. - even though it is plainly evident in the mortality tables. Science Fact: We never needed a measles vaccine. See above. The horrible death rates of the 1800's and early 1900's were WAY, WAY down at the time the vaccine era began - the bygone days of poor sanitation, poor hygienic, impure water supplies, over-crowding, and poor nutrition. Further, for over a century, measles has been a mild, self-limiting, immune-building disease of childhood. Parents wanted their children to get it so they would have lifetime immunity. According to the 1999 Merck Manual, people born before 1956 are considered immune by virtue of prior infection." And we now CAN’T be given the Measles vaccine, because it is considered too dangerous to do so. As it is for infants - for the reason that it hampers our natural immunity. With the MMR shot mandated in 1978, measles was resurrected but mutated to a different form - the atypical version. Modified rash or rashness measles. A man-made form. And an adult form, transmissible to infants, and there is no immunity for it. Prior to the vaccine era, infants didn’t get measles; it most commonly began in children under ten, beginning at age two or three; now infants and adults are getting it, much more vulnerable populations for measles infections - and for which there is no natural immunity, and at best only short-term artificial immunity from the vaccine. A similar pattern is occurring with pertussis also. We have thus traded natural diseases which had become relatively benign just prior to the vaccine era, for new, more virulent vaccine induced strains of disease. This is a real problem that the pro-vaccinators are well aware of. Their solution? More booster shots, and more vaccines well into the future. This atypical form of measles is likely what most of the new Disney cases have. Or they came from mothers who themselves had been vaccinated for measles and therefore could not transfer any maternal antibodies against wild measles to her infant; another big problem since mass vaccination began. So, the people from Disneyland were mostly all been vaccinated. This is a group of vaccinated people. Any media story on measles vaccine which omits this science is deliberately misrepresenting the facts. It's not newsgathering any more - they are following a vested agenda. - How were they diagnosed? - What percentage were diagnosed on the phone, with no physical examination? This common practice we saw with swine flu and other recent disappearing epidemics, employed when trying to create numbers for maximum fear value. - What clinical tests were run that would distinguish wild measles from the man-made strain in the MMR shot? - What percentage were vaccinated? Statistically it would be at least 85%, at the very least. More likely 95%. And with the scientific reality of the atypical version of measles being created by the MMR vaccine, it is more than likely that majority of the Disney cases were vaccinated. Yet they blame the unvaccinated, in this ‘hotbed of anti-vaccine hystery’. What really happened at Disneyland? This short, easy reading yet extensively referenced article discusses a number of very important points you should know: how one MMR shot didn't work, two aren't working, researchers in fact admit measles will never be eradicated, yet their response now is: let's vaccinate all adults with a third shot - and see what happens. Welcome, Dr. Mengele. Can you see where this is going? Frighten parents now, then blame adults later, get them to surrender their health rights, conscript the brown shirts to turn them in, have the police arrest those who haven't been vaccinated (or accepted the 'right' drugs/foods/lifestyle), make college or employment illegal for those who have not submitted to what the medical power structure says is the truth, then, before you know it, something very precious is lost. Remember, there are currently hundreds of vaccines in the pipeline, and countless new drugs; they are trying to outlaw supplements, or make them available only under prescription, and so on. Far too much simple trust is asked of us by those with money and power. The vaccinators cannot answer that question. They don't understand it. Their faces go blank when asked it. They change the subject and absolutely will not answer the question. They demand to have their opinion on vaccines, but refuse to allow an opposite opinion, even though both positions are protected by law. We are approaching a situation on this issue reminiscent of the Third Reich, wherein people, well-programmed and propagandized by the popular media, as of this writing are now sending letters to the newspapers saying parents should be jailed, sued, or even shot for not vaccinating their kids. Think, however, who will they come for next? Or on the other hands, the vaccine experts do answer, by simply continually change the ‘settled scientific facts’ to suit their need. Some years ago a report labelled "The Half-Life of Truth" came out showing that among cardiologists 50% of what they considered to be true 20 years ago is not considered to be true today. 50%! And the vaccine issue is supposed to be “settled science”? How many vaccines have been tested on the live population, then re-called after being found dangerous? Do you even know? The answer is “lots of them”, from polio to pertussis to swine flu to rototeq. The science is far from “settled”. No medium or long-term safety testing is done either before or after release of a vaccine into the public. We are the guinea pigs. The real testing is after the vaccine is released to the public. No honest test of vaccinated versus unvaccinated is ever done. Originally the measles vaccine was sold in the 1960’s on the premise and promise of a single-dose conferring lifetime immunity. When that did not work, they said two doses were required. Then it was said that a certain percentage of people vaccinated was needed to achieve 'herd immunity'. This was in fact a devious semantical change of the term herd immunity, which previously had scientifically meant when a disease burns itself out in population over thousand of years as more and more people became naturally immune to it and passed that immunity on. 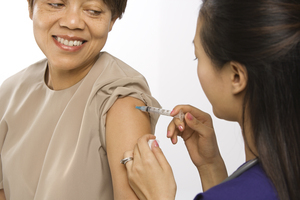 The term herd immunity is now used, however, to mean 'a certain number of people vaccinated'. But this term is constantly changing, i.e., when vaccination rates reached 50%, measles started to grow again after having been almost gone at the time the vaccination campaign began. When rates reached 85%, incidence kept increasing. Measles was declared gone in 2002, but now that we have reached a 95%+ vaccination rate, again there are outbreaks. Instead of questioning the vaccine paradigm, the few unvaccinated are blamed. This is a common ploy when the vaccinators have no answer why the vaccines are not working as promised. Proponents are now clambering for a 100% vaccination rate. This, they say, is needed for complete herd immunity. When confronted with the question, "if vaccines work why are you worried if someone else is not vaccinated?" they point to the few immuno-compromised or otherwise sickly people who cannot be vaccinated and say that the immunity of the larger 'herd' is needed to protect these people. However, research does not show that they will be protected, as no vaccine will prevent one from being a carrier of a disease. Further, this argument is also used for the flu vaccine in regards to the elderly. But the independent Cochrane Collaboration found NO evidence of protection afforded to the elderly from caregivers having been vaccinated. There is no hard science behind this new conception of herd immunity. And it is not true herd immunity! 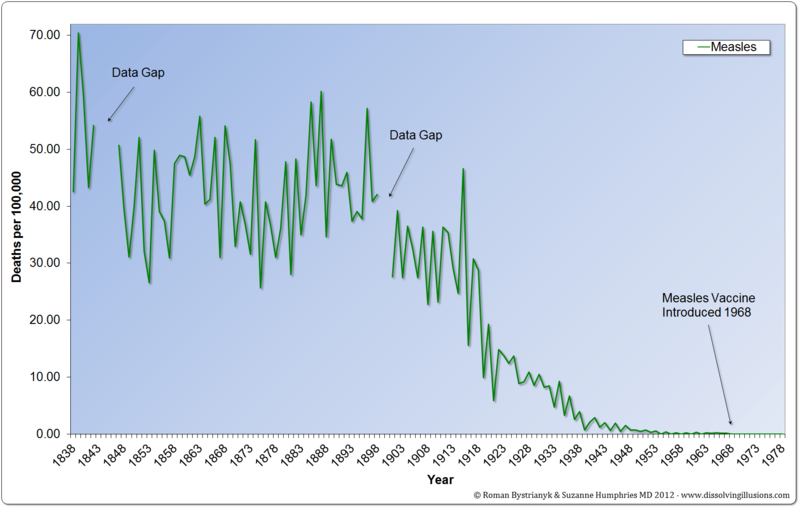 Even complete vaccination will not achieve the desired goal: over the last 30 years there have repeatedly been outbreaks in the U.S. in populations in 100% vaccinated populations. And, as mentioned in Part One, measles antibodies are low after vaccination, and booster shots offer less and less immunity; this is a problem that researchers know about. A similar problem exists for pertussis or whooping cough. This is due to Original Antigenic Sin (OAS) , also referred to by some immunologists as "linked epitropic expression", also discussed in Part One. In layman's terms this means that the vaccine sets a person up to respond only to the modified lab version of the virus, rather than the actual wild measles virus, and then also can lead to atypical forms of the disease for which there is little or no immunity. James Cherry, M.D., a noted pediatrician and vaccinist, warned of this in 1980 when he remarked that in the post-vaccine era measles had become a "time bomb." One possibility of this scenario may be that in instances such as the Disneyland case it is immigrants from countries where wild measles is still endemic, and where vaccination is low, that bring the virus to the U.S. where it has largely burned itself out and then expose the vaccinated to a form of measles they are no longer immune to. Unless one was born in the 1950's, contracted the disease and are immune for life, or are unvaccinated and children of parents who were also unvaccinated. Some researchers warn that achieving the goal of 100% vaccination may actually lease to the paradoxical situation in future decades where the population is less and less protected and thus vulnerable to an epidemic of wild measles. One thing is certain: the vaccinated can transmit the disease to the unvaccinated. The CDC and WHO admit it. It is well-known by immunologists that measles virus may remain latent in the body for years and mutate with unforeseeable consequences. It is this reason that led Felix Mendelson, M.D., to write that many doctors in the Los Angeles area refused to vaccinate their own children when the measles vaccine first came out. Fortunately, measles is successfully treated with Vit A, and in most cases remains a mild, self-limiting disease of childhood. This was done in the 1800's, and is used in some hospitals today, with much success. Most people with measles (and some other infectious diseases) are grossly deficient in Vit A. The media wants us to get excited by 100, or even 200 cases (NOT deaths) over a year - but in a population of 370,000,000? I’ll bet there were that many cases in my little hometown in New York when I was a kid in the 1950’s. Just about everyone got it, and we also acquired lifetime natural immunity. In fact, a few years before my time parents sometimes held "measles parties" so their kids would get it and be done with it - since nearly everyone got it anyway. You may not have heard the name Wakefield, but your pediatrician and junior staff writers routinely chime in on the autism issue in the press with statements like, "and the guy who first created the theory was a fraud, had his license revoked, was discredited, etc." Or the latest, "a 20-year study disproves the MMR-autism link once and for all." Nothing could be further from the truth. You have been lied to big time. And I am NOT saying that MMR causes autism. But here is the truth as far as I can see it. First of all, is Andrew Wakefield just a dishonest quack, misleading those "really stupid people out there" (as according to the above-mentioned James Cherry, MD) who choose not to vaccinate? Doesn't seem so to me. Second, Dr. Wakefield did not assert in his original research that the MMR vaccine (specifically the measles component of this triple vaccine) is definitely the cause of autism, only that there was an association between measles vaccine virus, ileal-hyperplasia/gut disorder, and parent's reports of autistic behavior change, and that on this basis his findings "warranted further research." This suggestion in itself was enough to send the drug-company-backed head of the UK's vaccine program into a fit. An orchestrated campaign was begun to pillory and dis-enfranchise Wakefield. (By the way, there were three doctors involved with his original research; they could afford better lawyers than he and got off without losing their licenses). But anyone can 'discredit' anyone. It happens in politics - and medicine - all of the time. It has little to do with truth of a matter in most cases. Money talks. Since 1998 Wakefield has published nineteen peer-reviewed papers on his findings, and there have been over twenty studies from other countries confirming his results. Yet you never hear about this in the media; all you hear are pediatricians and junior newspaper writers ranting about Jenny McCarthy and other 'stupid people' who do not accept the obvious 'settled' science. This is a diversion from open and honest discussion of a serious issue, but one with the force of big money behind it. Do you really expect the newspapers to publish truth when they get billions in advertising from pharmaceutical companies? Or the medical colleges to teach truth so long as they depend on funding from the same? The so-called 'study' that the medical media repeatedly cites as 'proof' that there is no vaccination/autism link, was done by a man, Poul Thorsen, under indictment for twenty-two counts of medical fraud, and currently on the run from the authorities. More over, whistle-blowers from the CDC have recently admitted there was omission of evidence of a 340% increase in autism in African Americans. The science is far from 'settled'. In fact, that entire concept is absurd. Science is continually changing as new knowledge supplants the old. Besides the suggestion that an MMR-autism link needed further study, what also led to Wakefield's persecution was his other suggestion that it might be safer to allow single vaccinations instead of the triple vaccine MMR (or DPT, which has not been used in most European countries, Japan, or Australia for many years). Wakefield and many UK physicians were concerned when MMR came out, as no studies have ever been made for the safety of combining three vaccines into one. They still have not been done. But MMR was mandated in the UK, and single vaccines are no longer available there, as well as in the US, although they used inn Europe. It does't take a genius to recognized that as virus' are known to mutate and recombine, this practice of giving multiple vaccines in one visit has serious potential risks. But to question this would jeopardize the vaccine industry, so the full weight of lobbying dollars as well as the force of the law was brought to bear against Wakefield, as it often is against any other doctors who raise doubt about vaccines. After reading the book he wrote bout his court trials, there is little doubt in my mind that he was framed. The history of medicine is full of case after case when a pioneer was railroaded because he upset the establishment. It took fifty years after they sent Semmelweis to a mental hospital for suggesting that doctors, especially obstetricians, wash their hands between patients, for the medical establishment to actually follow his advice. This reduced puerperal fever, the scourge of the nineteenth century, savings millions of lives - much more than any vaccine ever did. In fact, this reduction in infant mortality is largely responsible for the increase in average lifespan - the simple washing of hands, and not the miracles of modern medicine. As mentioned, Wakefield's findings on measles virus in the gut of autistic children was published in the medical journals in 1998. Further papers were published up to 2010, then one was published, but without his name attached, and then finally retracted - a very unusual procedure. Incidentally, physicians in different countries, including Japan, Italy, and elsewhere made similar findings as Wakefield, and the measles-autism link was actually reported as far back as the 1940's-1950's. So it was not entirely new. A group of scientists led by Dr. Stephen Walker addressed three major critiques of Wakefield's original study. In a preliminary report in 2006 they, too, found vaccine-strain measles in bowel lesions of a series of autistic children. Currently their work is stalled due to lack of funding. A Japanese group led by Kawashima had similar findings. So to claim that there has been a 'twenty year study' debunking all of this is just bogus. True studies comparing vaccinated versus unvaccinated populations are never done, but usually only epidemiological studies which are more easily manipulated to produce the desired results. "Epidemiological studies, also called population studies, are the poor cousin of true clinical trials. They are not controlled studies done under set scientific conditions, but rather attempts at verifying a hypothesis by counting the incidence of a certain disease within a certain population. The problem is that results from epidemiological studies are subject to widespread interpretation, depending on who's doing the counting, who decides the criteria for what gets counted, who publishes the results, etc.. For this reason, epidemiological studies can be used to prove two opposite hypotheses. Simply put, "Epidemiological studies are unable to uncover causal mechanisms." In the exploding vaccine industry today, epidemiological studies are quickly becoming the standard to evaluate our need for vaccines, because they're faster, cheaper, and capable of supporting practically any required outcome." (Vaccination Is Not Immuniziation, p. 150-151). And just recently have appeared several cases in the courts (here, here, and here where children who developed autism after MMR and other vaccinations were awarded huge sums by the courts - even while the CDC still denying there is a link. And the same British court system that backed the medical establishment in denying any vaccine-autism connection has recently paid out $7 million for an autism case. But most pediatricians seem to be in the dark about this. If one looks closely he will find in any case that the current assertion repeated again and again is not that any vaccine-autism link has been disproved; rather, it is claimed that it has not yet been proved. There is a difference. And since there has not been, and never will be (unless public pressure is brought to bear on the vaccine makers), an unbiased, double-blind, placebo controlled study with both a vaccinate and unvaccinated population, it will never be proven to the satisfaction of the drug industry. Well, all right, there may not be a link, but why not spend the $20 billion to fund a true study to really find out if there is, instead of continuing to stonewall? That is what some courageous congressmen and medical researchers have suggested. It may well be not just MMR, however, but the total load of vaccines and/or mercury. With thousands of adverse reportings, we owe it to ourselves to find out. The IOM (Institutes of Medicine) came as close as possible to condemning mercury in its 1999 proceedings, when thirteen world experts on the subject gave their testimony one after the other soundly arguing for a mercury-autism-brain injury link (indeed, graphs on accumulated mercury use and autism follow a perfect straight line - see Mark Geier, M.D.,Journal of American Physicians and Surgeons, Spring, 2003), but at the end of the day their testimony was ignored. Geier said, "this is about as proven an issue as you're going to see...what is occurring here is a cover-up under the guise of protecting the vaccine program." Because Dr. Geier has worked to promote awareness the dangers of mercury he has become an industry and AMA target. "Doctor, how many studies have been done on the toxicity of mercury in the brain?" "And how many studies have been done on the safety of mercury in vaccines?" "What's that, I can't hear you. How many studies?" This is what we are up against. By the way, Dr. Geberdeng is now of Merck's vaccine division. It should be noted that there is another contributing theory on the autism epidemic, in addition to MMR and mercury: the ubiquitous presence of glyphosphate (the chemical in Round-Up) in the environment, our foods, and in autistic children. See this article for a risk that one author says will lead to HALF of our children being autistic by 2025. It is already, depending on the source, at one in twenty-five to fifty - up from a rare one in ten thousand just two decades ago. At approximately $70,000 a year to raise an autistic child (five times that of a normal child), some predict that our health system and GDP will not be able to do anything else but finance these children. It is a colossal problem. Most likely there is a potentizing and synergistic effect between MMR, mercury-containing vaccines, and environmental toxins like glyphosphate (similar to the effects of arsenic or DDT (and diphtheria vaccination) which may have hyper-activated the polio virus in the 1950's - see Part One). Wakefield himself believes that MMR as well as mercury and toxic ingredients in vaccines combine to cause autism. It is suspected that glyphosphate opens the blood-brain barrier, allowing the glutamate in MMR vaccine to enter and excite neural tissue. One thing is certain: there are not too many possibilities of something other than the increased use of these things that has changed in the past two decades to affect our children so dramatically. If you have doubts this is possible, or have never witnessed an autistic regression soon after vaccination, this brief, graphic video may move you to tears. Not given as much press as mercury, it is well-known to researchers that aluminum, of which the childhood vaccination schedule gives a cumulative enormous amount, is capable of almost all of the neurological adverse effects as mercury, including autism, seizures, encephalitis, Guillain Barre, and so on. When injected in the bloodstream it is neurotoxic and lasts forever. This is likely one of the reasons that all of these symptoms have remained at high levels even with the slight reduction of mercury in the pediatric vaccines. That is, the argument is given that since mercury has been lessoned in pediatric vaccines, and autism rates have not gone down, then mercury could not be a contributing cause of autism. While mercury has been ramped down in some vaccines, however (as discussed below), at the sane time the adjuvant aluminum has been ramped UP. So it is not surprising that neurological symptoms such as autism, etc., have not decreased. Aluminum combines with fluoride from food and water to form fluoroaluminum, which is neurotoxic and excitotoxic to the brain. The work of Russell Blaylock, MD, and neuro-immuno-toxicologists deals extensively on this. But the average physician most likely has never even heard of it. It is not taught in school, so unless one makes a special and detailed study of the subject he or she falls back on propaganda slogans from the medical trade associations. In addition, aluminum is still listed as GRAS (Generally Recognized As Safe) by the EPA,so it is easy to dismiss it as a concern. But there is a huge difference between a little aluminum in a cosmetic, or antacid preparation, and aluminum injected directly into the infant bloodstream and then lodging in the brain. But hasn't mercury been eliminated from pediatric vaccines? This is what doctors tell parents. And it contains a half-truth. Yes, after decides of protest, and the rest of the world long ago having stopped adding mercy to their vaccines, and the FDA finally asking (not demanding, just asking - which sort of tells you who the master here is?) that manufacturers remove mercury from childhood vaccines, there has been some compliance. I say 'some' because no one really knows for sure how much. However, according to the CDC's own figures, as of 2008 or thereabouts, the amount of mercury in the DPT shot was down from a very high level to only the EPA's maximum adult safe dose of 0.1 mcg/kg of body weight. So there was some reduction. But, in the meantime, they have added influenza vaccine to the schedule, with several doses during the first year of life, and yearly after that - and the flu shot has 25 mcg, which, for a ten pound infant, is 50 TIMES the EPA maximum safe dose for an adult!! And that is for each cumulative dose. That's a lot of mercury accumulated in the brain and neural tissues. The Hepatitis B shot also contains an undisclosed amount of mercury. So overall there may not have been much if any a reduction at all. As mentioned, moreover, the total aluminum content in childhood vaccines is an unconscionable insult to the developing nervous system. In 1980 children received four aluminum-containing vaccines, now it is seventeen; the total amount of aluminum in the first eighteen months has gone from 1120 mcg to 4925 mcg, the total for all childhood vaccinations is 6150 mcg - over 6 mg! Pediatricians and vaccine promoters in the U.S. argue this is an insignificant amount compared to the amount in foods or certain medicines such as Maalox. But it must be remembered that 100% of the aluminum by injection is absorbed, while by the oral route only 0.2 - 1.5% is absorbed. So such argument is specious. It is also never mentioned that an infant's kidney filtration rate is immature, less than half that of an adult. Yet we give newborns and even babies born premature the HepB shot - which alone has 225 mcg of aluminum per shot. According to a paper in 2011 by Dr. Kawahara, aluminum inhibits over 200 biologically important functions, including mercury excretion by the body. In the 90 years of its use as an adjuvant in vaccines, it has never been tested for safety. But inasmuch as there is no readily available alternative, the industry resists stopping its use on the grounds that "it could interfere with the vaccine program." A similar reasoning is used for not eliminating mercury in vaccines still used overseas - that it would reduce confidence in the program. Never mind that they are a poison to the human body. [For more read The Case Against Aluminum in Vaccines]. A major risk that is increasing right now is that selective forgetting of history, selective distortion of evidence, and the power of the pharmaceutical industry is using big money to pressure us all into giving up more of our rights - including that of questioning medical authority. Even if you believe certain major infectious diseases were helped through vaccines, that does not in a blanket fashion mean all of the newer vaccines that have been given to our kids since 911 are needed. We are being pressured into just accepting an arrogant stance by the pediatricians - who in turn follow their own higher-ups - that our kids have to have the over 70 vaccines the CDC Schedule now says they have to have to get into public school. This has to be authorized by each state, but with few exceptions they accept the CDC recommendations. This is itself full of conflicts of interest: for example, Texas Governor Rick Perry and permanent members of his cabinet had ties to the vaccine industry staff when he made Guardasil mandatory for girls to enter school. At the very least, a parent should gave the right to choose, albeit and hopefully with some intelligent reasoning process, which of these they feel are really necessary or safe. Because many of the newer ones so far have big problems, are BANNED in different countries because of deaths and disabilities, and are not for major infectious diseases at all, but nearly hypothetical or minor possible problems. And fast-tracked into the Schedule. Case in point: one of these is H.P.V. (Gardasil) for cervical cancer. Not only has there been NO causal link established between this virus and cervical cancer (only a slight association with a small population who had cervical cancer, suggesting 'further studies may be warranted"), but the Merck people went and claimed it was a cure. No bother to note that this virus is present in 50% of normal woman. 100 girls died in the UK and US between 2010-2012 from this - but you probably never heard of it on the news - here anyway. Currently the CDC denies a connection. Fact: the average age for cervical cancer is 50 years, yet even the manufactures only claim efficacy (whatever that is) from the vaccine for up to a year! So any acclaimed benefit will have worn off long before it would do any good - if it works - which it doesn't. So, the reasonable doctor should ask, "what is the rush to give it to infants?!!! Another is Rotoshield. This one was so dangerous that it was pulled, only to re-surface a few years later as Rototeq, with the FDA saying that "the problems with the earlier version being fixed," - only to find shortly after release that they were still there and dangerous. But it is still int he Schedule. What kind of problems? First realize that this vaccine was invented for the dangerous childhood condition formerly know as 'colic' - mostly a mild case of diarrhea, etc.. Not serious at all. But the nice adverse effect from Rototeq is intussusception, or telescoping of the bowel, a potentially fatal disorder. Nice to know that Paul Offit, MD, the one who says 'children can handle 10,000 vaccines - or more', is the patent holder for Rototeq. Of, in the initial clinical trials nearly 1 in 1000 kids died, and many cases of SIDS occurred. All of this risk for what? What urgency? A minor child hood complaint - not with dangerous pandemic infectious disease potential. Then there is Prevnar (PCV), first marketed for "otitis media" and "bacterial meningitis". Only problem is that it was never tested for bacterial meningitis. Otitis media? - earache? We need a vaccine for that? In Japan this one is banned for causing 6 deaths. This story was barred from US media and only carried in Europe, Asia, and Canada. I see now they are marketing it for pneumonia on TV. It has diphtheria and strep pneumonia in it. One listed adverse effect: pneumonia; go figure. Remember, this was not tested for bacterial meningitis, only otitis media. And there were 12 deaths among the initial subjects. I already wrote that Hep B is banned in France, and only used in newborns here and nowhere else. Hardly used anywhere else, in fact. There are risks. Then there is HiB. Ask a parent if they even know what this is for. Called homophiles influenza type B, it is sometimes associated with influenza and other infections, but is not influenza; normally a mild self-limiting ailment of childhood. This vaccine is banned in Japan, Finland, and Sweden, for "no efficacy found." In the U.S., however, there are 3 doses by six months of age - even though the manufacturer says "before 24 months the efficacy of the vaccine is uncertain." So let's not buy into the argument that any or all of this is hard, settled science that we should just accept, it is not, and it is not common practice through out the civilized world to use all of these vaccines, that are often now quietly slipped into the mandated Schedule without fanfare. Many pediatricians here, I challenge, are arrogant, lacking in intellectual integrity, honesty, or courage. Or just afraid to make waves. Some are honest and faced with massive cognitive dissonance over how to proceed in their practice ethically. Try to find one who will work with you to at least choose which vaccines you want and consider safe for your child. Don’t be intimidated by their threat to dismiss you from their practice if you don’t go along with everything they say. I will not mince words: the future of all of our human health freedoms are at stake. Science cannot be ruled by public opinion or corporate money. In sum, in the last several decades the business of medicine has superimposed its purpose on the science of medicine. Doctors today do not have free access to true data on which to make informed medical decisions for their patients. Rather, they have marketing information, brought to them by industry reps - not scientists - with degrees in advertising, public relations, and so on. Given a three-week crash course in their merchandise, they wine and dine their clients (doctors) who get incentives for promoting certain drugs and vaccines. It is odd that the public somehow believes that the area of vaccines is sacrosanct and immune to this reality. But, think about it, why should one have utmost faith in companies who regularly pay out huge fines for fraud or damages? A few examples: Johnson and Johnson paid out $2.2 billion for off-label promotion of Risperidol for kids (but who cares? They made $44 billion on the drug); GlaxoSmithKlein paid $3 billion for the same off-label use of Paxil; Merck paid $3 billion in damages for the notorious drug Vioxx. Why expect them to be totally honest about their vaccines? At the very least, some skepticism is in order. In my mind, there is no excuse for a professional not to regularly study up on their area of expertise and practice. To be kind, however, I will say that perhaps medical doctors are not altogether to blame: the history of vaccines, the downsides of vaccines, the ingredients in vaccines, are subjects not taught in medical school. What they are taught is the official vaccine schedule, when and how to use it. They do not make policy, they are told to carry out policy. And who makes policy? Drug makers pay/lobby lawmakers to sanction their own policy; drug makers finance medical colleges, and get them to teach their policy. The poor overworked doctor only carries out this policy (or 'standard of care'), or he risks board sanctions or being singled out as a troublemaker. But there are principled and courageous doctors out there, and all of the above is not, in my opinion, a legitimate excuse for failing to standing up for truth. "Critical medical decisions for an entire generation of American children are being made by small committees whose members have incestuous ties with agencies that stand to gain power, or with manufacturers who stand to gain enormous profits...The relationship of the patient and physician is dramatically altered in administering the vaccine - the physician is serving as the agent of the state...Public policy regarding vaccines is fundamentally flawed...permeated by conflicts of interest. It is based on poor scientific studies that are too small, too short, and too limited...The AAPS calls for a moratorium on vaccine mandates and for physicians to insist on truly informed consent for the use of vaccines.."
"School children [are used] as research subjects...without informed consent, in violation of the Nuremberg Codes...We suspect financial ties between vaccine manufacturers and medical groups such as the AMA and the American Academy of Pediatrics which endorse the vaccines...The federal government pays the state a bonus of $100 for every 'fully' vaccinated child." When asked before Congress if had any conflict of interest over approval of the Rototeq vaccine, inasmuch as he was: a patent holder for the vaccine, had received benefits from the manufacturer Merck, and was in fact a member of the FDA Board of Advisors, Paul Offit, MD, said, "absolutely not." And so it goes. The sad fact within the industry is that this is not the exception, but standard operating policy. Now that you have read this, you are well-equipped to see the scientific and historical falsehoods - and frightening implications - in this industry promotion announcing three hundred vaccines in the developmental pipeline. Read this if you care about your kids - and our medical freedom.